First off, the acting is somewhat uneven: Giamatti, Pike and Hoffman are great but some of the others are not (in the words of one movie-fan, “their performances are wooden”). Production values are all over the place: there is little or no attempt to accurately portray the time period with appropriate costuming and other less important details (as outlined below). On the other hand the set for the Ritz Carlton ballroom has been built at great cost and looks it. At 2 hours and 12 minutes it’s a tad too long. There are more than a few opportunities to get it down to a more reasonable length starting with the subplot about the detective trying to pin something on Barney. 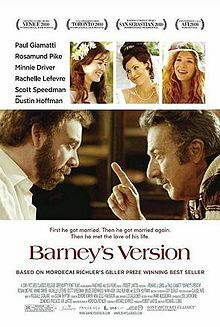 Despite these shortcomings the title pretty well says it all: an engaging film about the reminisces of a man in his mid-sixties (Barney) and his version of the facts. for language and some sexual content. • Not two minutes into the film and there’s a nitpick and it’s one of my classic all-time favourites: after a brief telephone conversation Barney hangs up and we hear the dial tone. In reality the dial tone is only heard after picking up the phone before dialling. That’s why it’s called a dial tone. • Later there are two more instances. Obviously the producers never caught on. • A title card indicates that the flashback events took place in 1974. In the scene with Miriam sitting on a train the VIA Rail logo is clearly evident. That marketing term was not introduced until 1976. • Just before leaving the station the on-board announcement over the PA says the “train is now leaving for New York City with stops in Springfield and Hartford.” Neither of these cities is on the route. • The Quebec license plate on Barney’s car has black lettering (or dark green?) on a white background. That combination of colours was not introduced until 1975. • Barney gets a phone call and answers on a clamshell flip phone. These only came out in the ‘90’s, long after these events took place. • Barney hangs out in Grumpy’s bar. Trouble is, it didn’t exist back then. • Another classic nitpick, the product placement rotating bottle, appears half way through. From one shot to the next the bottle rotates so that the Cutty Sark label is clearly seen. In this instance all this takes place while Barney and Boogie are “having a few” up at his cottage. • In 1990 Barney is being interviewed by a number of television reporters including one from the Canadian Broadcasting Corporation with the modern day simplified “exploding pizza” on the microphone. That version of the logo was not introduced until 1992. • One of the television reporters goes on to talk about “the accident that happened 30 years ago..” Actually it was 24 years earlier not 30. Traditionally Jews do not leave flowers at the gravesite. Instead they put a little pebble or stone on the headstone as a sign of respect and affection. Izzy in describing Barney’s second wife says “she makes a flaky kugel”. Kugel is a Yiddish word to describe a sort of pudding or casserole.